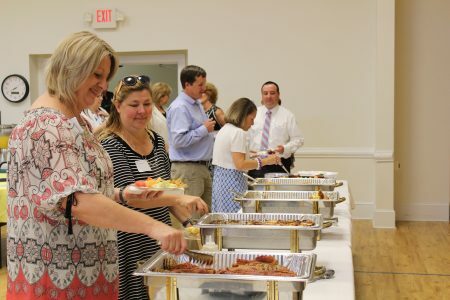 Thursday morning, members and staff of the Southport-Oak Island Area Chamber of Commerce gathered at The Brunswick Center of Southport for their 42nd Annual Meeting and Breakfast. This meeting serves as an opportunity for the membership to gather in fellowship and to recognize those who have gone above and beyond in their local business community. Thursday, the Southport-Oak Island Area Chamber of Commerce 2016/2017 Presdient Carol Magnani announced the recipients of the 2016-2017 Small Business Awards. The awards stem from nominations from both the Chamber membership and the general public. To compete for the award, a nominee must have been nominated for a Golden Pineapple Award during the 2016-2017 term as well as submit a packet of information for outside review by the Small Business and Technology Development Center at UNCW. If you have never attended a Coffee with the Girls you are missing all the fun. We have the best conversations - not always serious either. The next Coffee with the Girls is July 18th at 8am at The Wingate Inn. Topic: Advanced Directives. Speaker: Haylie Long, Lower Cape Fear Hospice & LifeCareCenter. The Southport-Oak Island Area Chamber held a ribbon cutting for Pelican’s SnoBalls Brunswick Beaches / Shallotte at the chamber offices this week. Pelican’s SnoBalls Brunswick Beaches / Shallotte opened its store on South Main Street in Shallotte in April 2015 and also have a remote vehicle that brings SnoBalls directly to business events, community events, schools and private events throughout Brunswick County.